New — Optum360 Edge — More clinical descriptions and focus points.Expanded with hundreds of clinical descriptions and focus points for new and changed 2017 codes as well as existing ICD-10-CM codes. • Optum360 Edge — Illustrations at the chapter and code level. Often an illustration is needed to enhance understanding. Illustrations of pertinent anatomy and pathological changes related to the disease process are included as a visual aid. • Optum360 Edge — Code Level Clinical Description. Code level descriptions are provided for select diseases, injuries, symptoms, other factors influencing health status, and other reasons for contact with health care providers. • Optum360 Edge — Clinical Focus Points. Improve overall coding accuracy with additional information for complex diagnoses and injuries that require an understanding of related codes and conditions that might better describe the documented condition. • Alphanumeric Organization by ICD-10-CM Code. 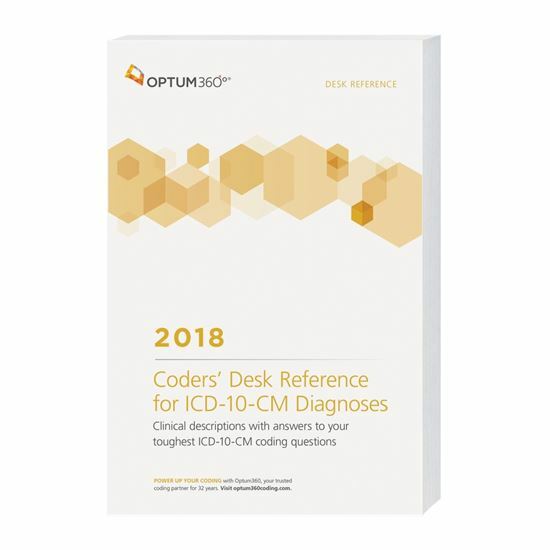 Locate codes quickly with a resource developed to work hand-in-hand with your Optum360 ICD-10-CM code book. • Enhance Understanding of ICD-10-CM. Understanding the meaning of the clinical condition captured by each code is essential to correct code assignment and this resource is designed to explain and highlight differences between codes that may appear similar at first glance. • Designed for Both Novices and Seasoned Coders. All coders will find that these clinical descriptions enhance understanding of ICD-10-CM.